The main objective of the study is to explore the relationship between Research and Development (R&D) investments and export behaviour in EU countries in the aspect of competitiveness. To this end, the micro-aggregated Community Innovation Survey 3 (CIS3) is used. Both the volume and the decision of R&D investment and export are found to be mutually dependent. Particularly, in manufacturing industry, the effect of export on R&D is underestimated and the one of R&D on export is overestimated. In the knowledge intensive sectors, circular causality link is broken between the R&D and export. Aw, B. Y., M. J. Roberts and Winston, T. (2005). The Complementary Role of Exports and R&D Investments as Sources of Productivity Growth. NBER Working Paper Series, WP 11774, Available at: http://www.nber.org/papers/w11774. Aw, B. Y., M. J. Roberts and Winston, T. (2007). Export Market Participation, Investments in R&D and Worker Training, and the Evolution of Firm Productivity. The World Economy, 83-104. DOI: 10.1111/j.1467-9701.2007.00873.x. Aw, B. Y., M. J. Roberts and D. Y. Xu, (2008). R&D Investments, Exporting, and the Evolution of Firm Productivity. American Economic Review: Papers& Proceedings, 98(2), 451-456. DOI: 10.1257/aer.98.2.451. Ball, R. J. (1963). The Significance of Simultaneous Methods of Parameter Estimation in Econometric Models. Journal of the Royal Statistical Society. Series C (Applied Statistics), 12(1), 14-25. DOI: 10.2307/2985907. Barrios, S., Gorg, H. and Strobl, E. (2003). Explaining Firms' Export Behaviour: R&D Spillovers and the Destination Market. Oxford Bulletin of Economics and Statistics, 65(4), 475-496. DOI: 10.1111/1468-0084.t01-1-00058. Bernard, A. B. and Jensen, J. B. (2004). Why Some Firms Export. The Review of Economics and Statistics, May 2004, 86(2), 561-569. DOI: 10.1162/003465304323031111. Cincera, M. and Van Pottelsberche De La Potterie, B. (2001). International R&D Spillovers: A Survey. Cahiers Economiques de Bruxelles, vol. 169. Cincera, M., C. Cozza and Tubke, A. (2014). Main drivers for local and global R&D sourcing of European Multinational Enterprises. Eurasian Business Review, 4(2), 227-245. Coe, D. T. and Helpman, E. (1995). International R&D Spillovers. European Economic Review, 39, 859-887. DOI: 10.1016/0014-2921(94)00100-E.
Durand M., J. Simon and Webb, C. (1992). OECD's Indicators of International Trade and Competitiveness. OECD Economics Department Working Paper, No.120, Avaliable at: http://www1.eeg.uminho.pt/economia/priscila/intocaveis/LEA_CI/M00007153.pdf. EUROPEAN UNION. (2010). Topics of European Union. http://europa.eu/pol/index_en.htm, Access data: July 2010. EUROSTAT. (2008). Anonymized Community Innovation Survey 3 (CIS3). Cd-Rom. EUROSTAT. (2015a). Glossary: High-Tech Classification of Manufaturing Industries. http://ec.europa.eu/eurostat/statistics-explained/index.php/Glossary:High-tech_classification_of_manufacturing_industries, Access date: January 2015. EUROSTAT. (2015b). Glossary: Knowledge Intensive Services (KIS). http://ec.europa.eu/eurostat/statistics-explained/index.php/Glossary:Knowledge-intensive_services_(KIS), Access date: January 2015. Fors, G. and Svenson, R. (2002). R&D and Foreign Sales in Swedish Multinationals: A Simultaneous Relationship?. Research Policy, 31, 95-107. DOI: 10.1016/S0048-7333(01)00105-6. Greene, W. H. (1997). Econometric Analysis, third edition. Prentice-Hall, Inc.
Gustavsson, P. and Poldahl, A. (2003). Determinants of Firm R&D: Evidence from Swedish Firm Level Data. FIEF Working Paper 178, October 2003. Hughes, K. S. (1986). Exports and Innovation: A Simultaneous Model. European Economic Review, 30, 383-399. DOI: 10.1016/0014-2921(86)90050-4. Keller, W. (1998). Are International R&D spillovers trade-related? Analyzing spillovers Among Randomly Matched Trade Partners. European Economic Review, 42, 1469-1481. DOI: 10.1016/S0014-2921(97)00092-5. Kleinknecht, A. and Ploot, T. P. (1992). Do Regions Matter for R&D. Regional Studies, 26(3), 221-232. DOI: 10.1080/00343409212331346921. Long, J. S. (1997). Regression Models for Categorical and Limited Dependent Variables. SAGE Publications, Inc.
Mairesse, J. and Mohnen, P. (2001). To Be or Not To Be Innovative: An Exercise in Measurement. NBER Working Paper, No. W8644. Available at SSRN: http://ssrn.com/abstract=294083. Marsh, I. W. and Tokarick, S. (1994). Competitiveness Indicators: A Theoretical and Empirical Assessment. IMF Working Paper No. 94/29, Cass Business School Research Paper, Available at SSRN: http://ssrn.com/abstract=883467. Rodriguez, J. L. and Rodriguez, R. M. G. (2005). Technology and Export Behaviour: A Resource-Based View Approach. International Business Review, 14, 539-557. DOI: 10.1016/j.ibusrev.2005.07.002. Roper, S. and Love, J. H. (2002). Innovation and Export Performance: Evidence from the UK and German Manufacturing Plants. Research Policy, 31, 1087-1102. DOI: 10.1016/S0048-7333(01)00175-5. Schmidt, P. (1976). Econometrics. New York: Marcel Dekker. Schumpeter, J. A. (1942). Capitalism, Socialism, and Democracy. New York: Harper and Brothers. Sjoholm, F. (2003). Which Indonesian Firms Export? The Importance of Foreign Networks. Papers in Regional Science, 82, 333-350. DOI: 10.1007/s10110-003-0163-1. Smith, V., E.S. Madsen and Dilling-Hansen, M. (2002). Export Performance and Investment in R&D. The Danish Institute for Studies in Research and Research Policies, WP 2002/4. Suh, J. (1993), A Simultaneous Equation Tobit Analysis of Research and Development in Korean Manufacturing Firms. Journal of Economic Development, 18(2), 127-149. Wakelin, K. (1998). Innovation and Export Behaviour at the Firm Level. Research Policy, 26, 829-841. DOI: 10.1016/S0048-7333(97)00051-6. Wei, Y. and Liu, X. (2006). Productivity Spillovers from R&D, Exports and FDI in China's Manufacturing Sector. Journal of International Business Studies, 37(4), 544-557. DOI: 10.1057/palgrave.jibs.8400209. Zellner, A. and Theil, H. (1962). Three Stage Least Squares: Simultaneous Estimation of Simultaneous Equations. Econometrica, 30, 63-68. DOI: 10.2307/1911287. Zhao, H. and Li, H. (1997). 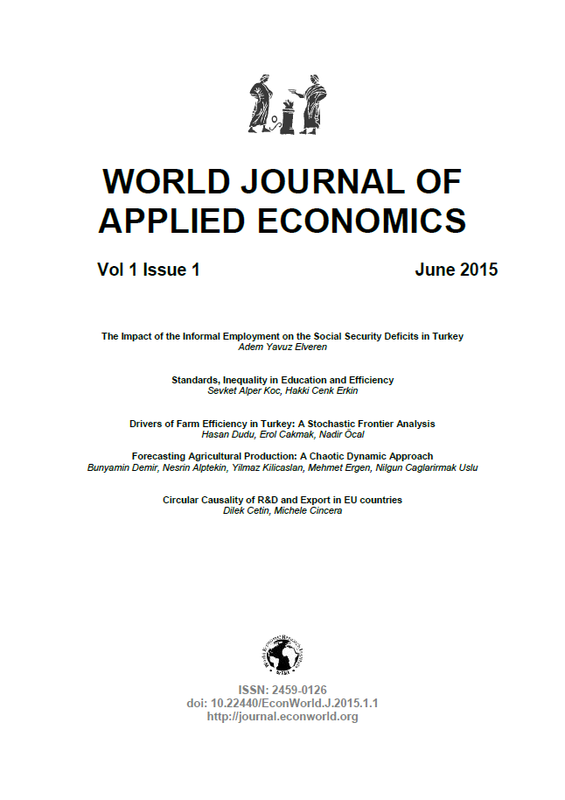 R&D and Export: An Empirical Analysis of Chinese Manufacturing Firms. The Journal of High Technology Management Research, 8(1), 89-105. DOI: 10.1016/S1047-8310(97)90015-8.